When summer rolls in, it brings in a lot of warm days and even worse, sweaty necks! It’s the perfect time to experiment with a new, shorter look that is sure to get those eyes rolling in appreciation. Not just that, it’s perfect for the weather and keeps you cool and fresh. Four women share with us their summer crop story and why it helps to chop those locks off. This ad professional decides to go short every summer, thanks to the crazy heat levels and the sweat and stickiness that come with it. Apart from this, she loves the fact that she can get to play with various styles and trends that are raging in the current quarter. She recommends Happy In The Head (INR 1,100) or Enrich (Cut by Bilal in Viviana, Thane for INR 900 with a hair wash) for the perfect bob, because they always make it a point to give her a haircut based on the shape of her face. She loves her short hair because it lets her experiment with colour and curls, especially beachy waves and it helps that the hair looks like it has a lot more volume. 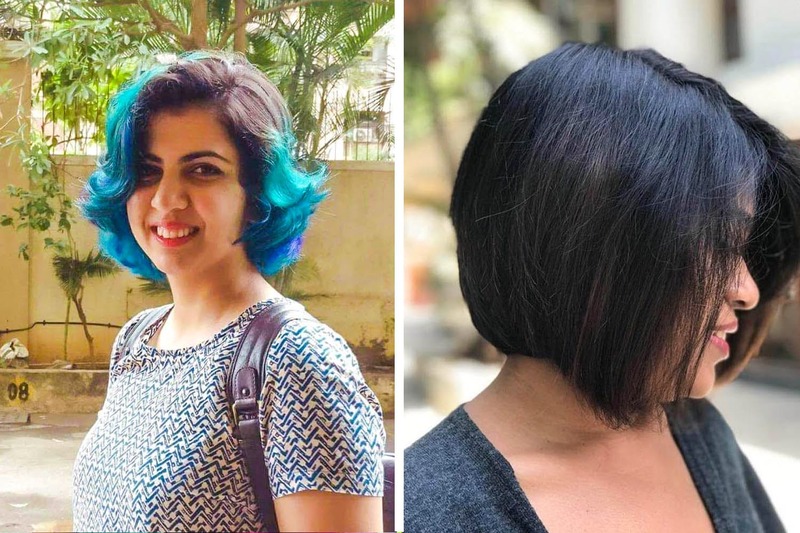 A journalist by profession, Vinamrata has always wanted to snip her hair short, thanks to all the Pinterest styles she’s been accumulating over the years. She’s mostly had long hair but has always wanted to experiment when it came to bobs. Then, a collage mate (Casey Sanker) called out to anyone who was willing to go short for a summer hair cut test at the B:Blunt academy in Andheri, and she decided to reach out. An ad professional, Arushi has experimented with different styles and colours when it comes to the hair. She picked Happy In The Head to get her haircut and hair colour done. She started off with a pixie cut and got green, blue and purple highlights, and then, grew out her hair and got the same combo for hair colour. She was thrilled with the experience, as they understood what she wanted. Bani (Happy In The Head) and her husband pushed her to get a haircut, and when she did, she fell in love with it. For her, it’s the best way to beat the summer heat. The first time round, it cost her INR 5,000, and then with longer hair, it cost her INR 10,000. She recommends a good place to get your hair styled and cut and feels that it makes a world of difference if they are on the same wavelength as you. Faye, an entrepreneur, decided a long time back that every summer deserves a summer crop, and religiously gets a cut when the winds are warm. She recommends Hetvi Burman from B:Blunt Malad who gave her a stylish cut, keeping in mind that she liked her hair kept away from the nape of her neck. She paid INR 1,400 for her cut and totally recommends the stylist (she’d also coloured her hair late last year from the same person).